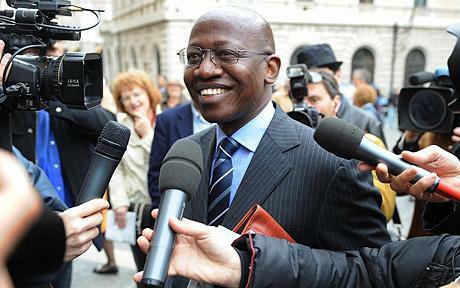 Born January 25, 1959 in Brazzaville, Republic of the Congo, Jean-Léonard Touadi, one of 10 children of a civil servant, immigrated to Italy in 1979 where he became a journalist, university lecturer, the author of several books, and a pioneering politician. A devout Roman Catholic influenced by French Jesuit missionaries, he entered the novitiate in Yaoundé, Cameroon, but by the early 1980s had renounced his religious commitment and decided he could more effectively work for social justice and fight poverty outside the priesthood. He completed a course of study in philosophy at the Vatican’s Pontifical Gregorian University where he earned a degree in philosophy, then studied political science and journalism at the Free University of Social Studies (LUISS Guido-Carli), also in Rome. Touadi allied himself with Antonio Di Pietro’s Italy of Values party (IdV) and in early 2008 was elected to a seat in the Italian Parliament, thus becoming the first-ever Member of Parliament born in sub-Saharan Africa. Soon thereafter he joined the center-left Democratic Party (PD). In November 2008, he characterized conservative Prime Minister Silvio Berlusconi’s joking description of US President Barack Obama as “young, handsome, and even tanned” as embarrassing and beneath the dignity of the Office of the Prime Minister. As legislator, Touadi worked on committees overseeing foreign affairs, racism and discrimination, justice, and the European Union. Defeated in his 2013 bid for reelection representing the Lazio district (Rome and surrounding enclaves), Touadi returned to academe, this time to teach African geography and development at the University of Rome Tor Vergata. Among his books are Africa, The Boiling Pot: Politics, Economy and Society (2003); Africa on Track: History, Economy and Society (2006); and The Green Continent: Africa: Cooperation, Environment, and Development (2011). Touadi continued assisting the government of Prime Minister Erico Letta in the capacity of advisor to foreign affairs minister Emma Bonino. Known to have friendly relations with personnel in the Vatican and the United Nations Food and Agriculture Organization (FAO), in September 2010 he attended a conference of the Congressional Black Caucus in Washington, D.C. Married to an Italian woman, Cristina Bacillieri, they have two daughters, Sophie-Claire and Sandrine.